Million of women, every year fall prey to breast cancer all over the world. World Breast Cancer Statistics in Women shows that 1.7 million cases of breast cancer are diagnosed in females. 25% of women affected by cancer suffer from this disease which can prove to be deadly if not diagnosed at the right time. Inflammatory Breast Cancer (IBC) is most aggressive form of breast cancer with ability to spreads to other body organs. Early detection of Inflammatory Breast Cancer Warning Sign and Symptoms is the only bet. Because it is a type of breast cancer, very hard to treat in advanced Inflammatory Breast Cancer Stages. The report indicates that Breast Cancer Symptoms differ in nature when caused before menopause and after it because of its direct relation with the female hormones. Women who consume a lot of alcohol are more prone to falling victim to breast cancer especially when they are in a premenopausal age. However, lactation also plays a great role in protecting a woman against breast cancer. The weight which you gain as an adult and the total weight which you had when you were born, are also main factors which contribute to getting affected by breast cancer. Just like premenopausal breast cancer, postmenopausal breast cancer also occurs because of a number of reasons. Consumption of alcohol is one of the top reason for Breast Cancer in Young Women. Weight gain and obesity are also among one of its major causes. However, lactation is a great barrier when it comes to the formation of the cancerous cells inside of the body. Those women who have got fat on their abdomens are more likely to get affected by breast cancer; this is why it is really important for them to be very active physically. A recent survey conducted in Brazil on the prevention of cancer shows that 22% of the breast cancers in the country can be avoided by totally eliminating the use of alcohol, loosening of the excess weight and by having a physically active lifestyle. According World Breast Cancer Statistics, Belgium has got the highest rate of breast cancer cases, which average up to 111.9 women per 100,000 women in the world. Denmark and France are on the 2nd and 3rd places. The United Kingdom is on the 7th number while the United States is the 9th country on the list having the most cases of breast cancer among women. Australia is on number 17 and Switzerland falls on the 20th place. World Breast Cancer Statistics in women also shows that there are 3.2 million breast cancer survivors in more developed countries as compared to the less developed countries. North America and Europe have the highest population of breast cancer survivors collectively. Asia and Africa having the lowest one breast cancer survivor rate. The reason being the fact that the developed countries have got far better medical facilities for diagnosis and treatment of breast cancer as compared to the developing ones. 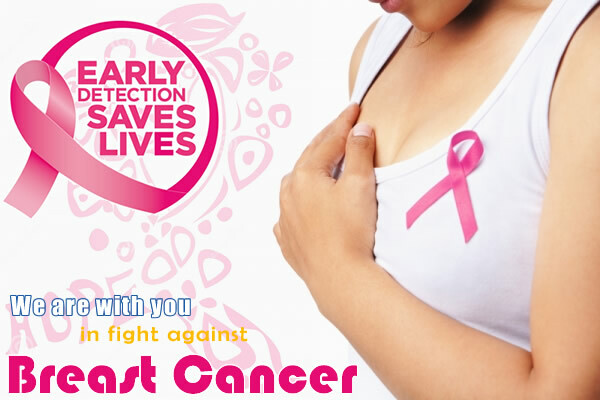 It also means Early Breast Cancer Diagnoses and treatment can save life of millions of patient. Since US is a land with a diverse number of people living in it, belonging to different races, so that rate of breast cancer diagnosis is different in it as compared to the other countries. According to a statistic, almost 127.3 of Non-Hispanic White women among a totally of 100,000 women are diagnosed with breast cancer. The number of African American breast cancer effectees follows next with 91.1 Latin/Hispanic women suffering from breast cancer on the third number. On the 4th and 5th numbers are the women belonging to the American Indian/Alaskan Native ethnicity and Asian or Pacific Islander ethnicity respectively. Out World Breast Cancer Statistics report indicates that the mortality rate of breast cancer patients also differs based on their racial ethnicity in the US. The African American women have the highest mortality rate followed by the Non-Hispanic White women. Women belonging to the Native ethnicity have the third highest mortality rate followed by the Hispanic and Asian women respectively. World Breast Cancer Statistics shows younger women as less likely to fall prey to breast cancer. Only 5% of the total breast cancer patients are women under 40 years of age. However, even though the rate of breast cancer is quite small among the younger women, it is still one of the main causes of death in women between 20 to 59 years of age. However, younger women who are diagnosed with breast cancer mostly inherit it from their ancestors. These women are also more likely to have either a BRCA 1 or BRCA 2 genes mutation which can also cause ovarian cancer among them. Diagnosis of cancer among pregnant as well as breast feeding women is very common. However, this cancer gets late in getting diagnosed as the breasts naturally enlarge in size and having a lump or a cyst is ignored in most of the cases. There are almost 13 cases of breast cancer among 10,000 of pregnant women, as per recent world breast cancer statistics. World Breast Cancer Statistics Reports reveals that the women living in the developed countries are more diagnosed with breast cancer as compared to those living in the developing ones. However it is also a fact that they are more likely to survive because of better medical facilities and the latest treatment options available.